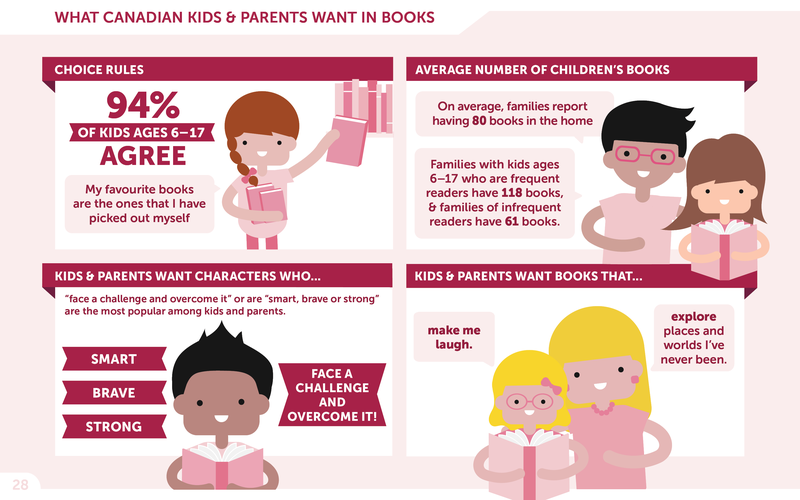 Choice Rules: 94% of kids ages 6-17 agree that their favourite books are the ones that they've picked out themselves. 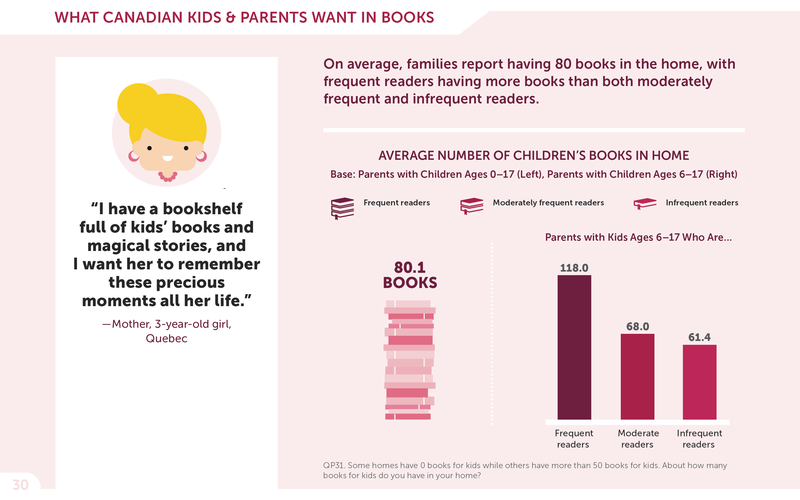 Average number of children's books: on average, families report having 80 books in their home. Families with kids ages 6-17 who are frequent readers have 118 books, and families of infrequent readers have 61 books. Kids and parents want characters who "face a challenge and overcome it", or are "smart, brave, or strong" are the most popular among kids and parents. Kids and parents also want books that make them laugh, and explore places and world's they've never been. Many kids, however, have trouble finding books they like-and parents underestimate the challenge. 47% of kids say that they have trouble finding books they like, whereas only 36% of parents report that their child has this challenge. This issue is more common in children who read less frequently, with 63% of infrequent readers having trouble finding books vs. only 43% of frequent readers. Boys also have more trouble finding books they like; 52% of boys say they struggle with this vs. only 42% of girls. Parents of kids ages 6-17 were asked which aspects brought diversity to the books their children and teens were reading. 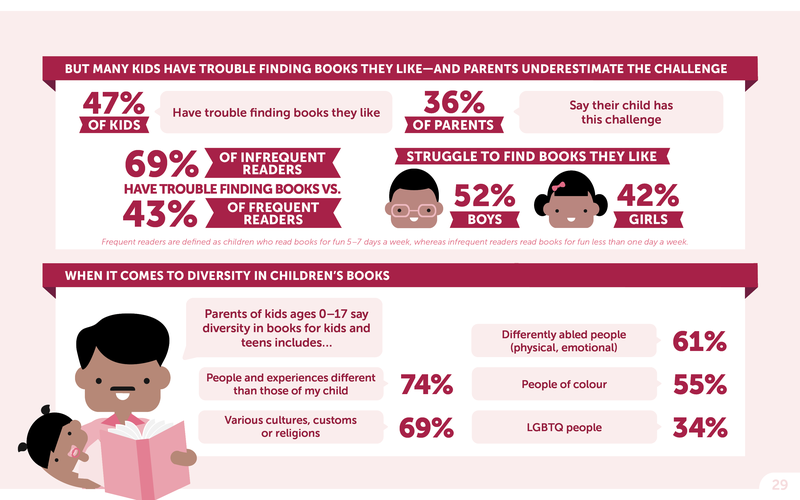 74% believed that the inclusion of people and experiences different than those of their children brought diversity to books. 69% believed that the inclusion of various cultures, customs, or religions brought diverstiy to books. 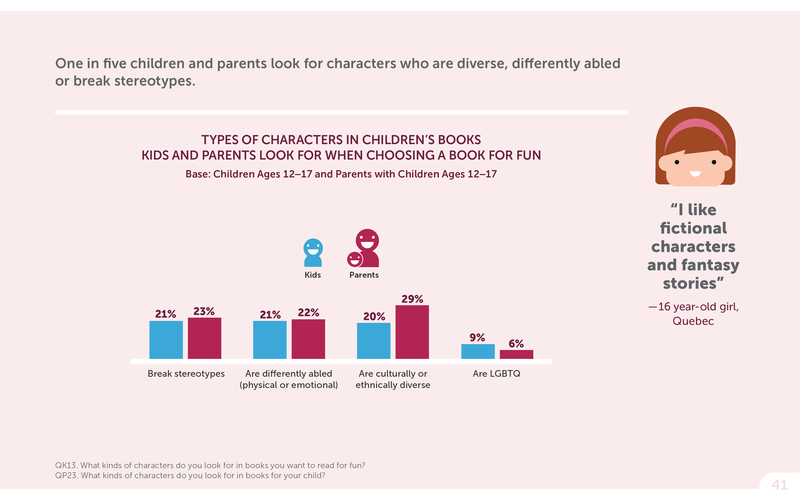 61% believed that the inclusion of differently abled people (both physically and emotionally) brought diversity to books. 55% believed that the inclusion of people of colour brought diversity to books. 34% believed that the inclusion of LGBTQ people brought diversity to books. On average, families report having 80 books in the home, with frequent readers having more books than both moderately frequent and infrequent readers. Parents of children ages 6-17 were asked how many books for kids they had in their homes. Parents of children who read frequently had the most books in their homes, averaging 118.0. Parents of children who read moderately frequently averaged 68.0 books in their homes. Parents of children who read infrequently averaged 61.4 books in their homes. Of all parents, the average amount of books per home was 80.1. An open ended response from a Mother of a 3 year old girl from Quebec on the importance of books: "I have a bookshelf full of kids' books and magical stories, and I want her to remember these precious moments all her life." 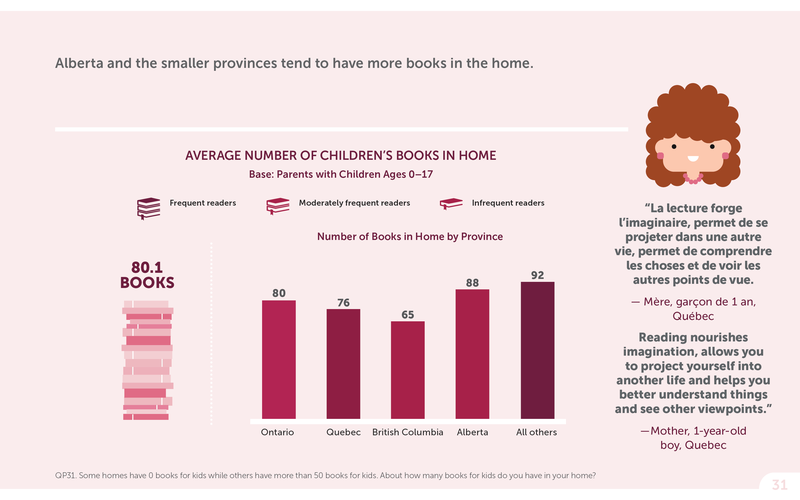 Alberta and smaller provinces tend to have more books in the home. In Ontario, families have an average of 80 books per home. In Quebec, families have an average of 76 books per home. In British Columbia, families have an average of 65 books per home. In Alberta, families have an average of 88 books per home. In all other provinces combined, families have an average of 92 books per home. 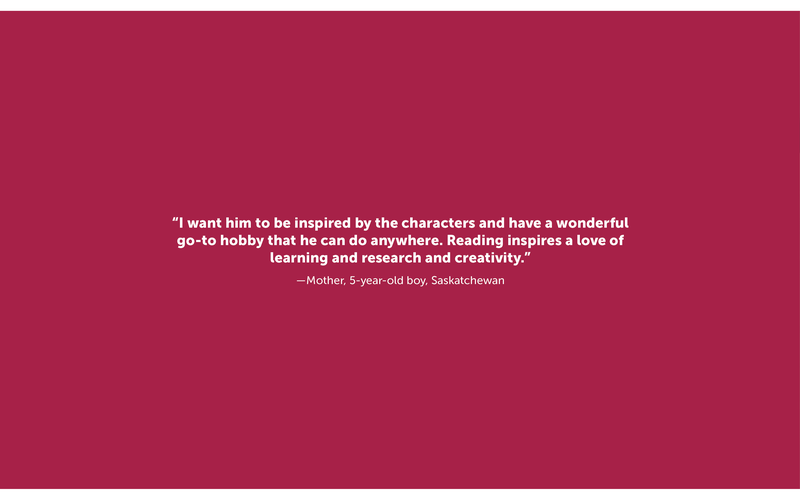 An open ended response from a Mother of a 1 year old boy from Quebec on the importance of reading books for fun: "Reading nourishes imagination, allows you to project yourself into another life and helps you better understand things and see other viewpoints." 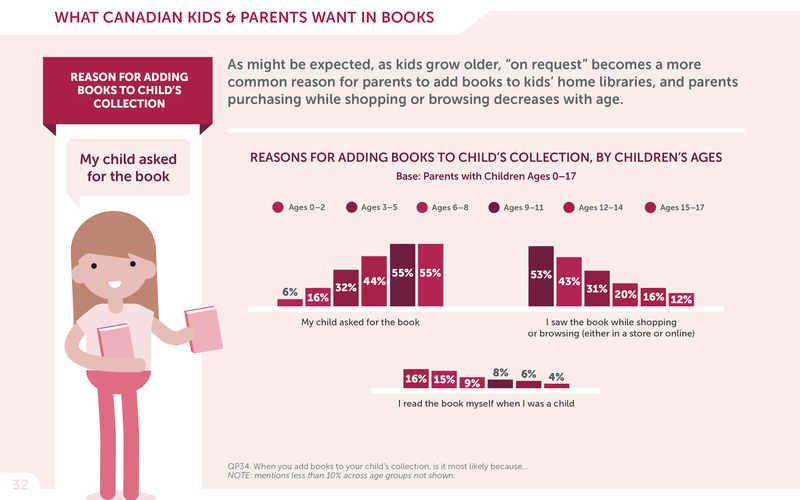 As might be expected, as kids grow older, "on request" becomes a more common reason for parents to add books to kids' home libraries, and parents purchasing while shopping or browsing decreases with age. Parents of children from ages 0-17 were asked what the most likely circumstances would be that would lead to them buying a book for their child. Parents of children ages 0-2 responded that they would most likely buy a book because their child asked for it 6% of the time, that they would most likely buy a book because they saw it while shopping or browsing (either at a store or online) 53% of the time, and that they would most likely buy a book because they read it themselves as children 16% of the time. Parents of children ages 3-5 responded that they would most likely buy a book because their child asked for it 16% of the time, that they would most likely buy a book because they saw it while shopping or browsing (either at a store or online) 43% of the time, and that they would most likely buy a book because they read it themselves as children 15% of the time. Parents of children ages 6-8 responded that they would most likely buy a book because their child asked for it 32% of the time, that they would most likely buy a book because they saw it while shopping or browsing (either at a store or online) 31% of the time, and that they would most likely buy a book because they read it themselves as children 9% of the time. Parents of children ages 9-11 responded that they would most likely buy a book because their child asked for it 44% of the time, that they would most likely buy a book because they saw it while shopping or browsing (either at a store or online) 20% of the time, and that they would most likely buy a book because they read it themselves as children 8% of the time. Parents of children ages 12-14 responded that they would most likely buy a book because their child asked for it 55% of the time, that they would most likely buy a book because they saw it while shopping or browsing (either at a store or online) 16% of the time, and that they would most likely buy a book because they read it themselves as children 6% of the time. Parents of children ages 15-17 responded that they would most likely buy a book because their child asked for it 55% of the time, that they would most likely buy a book because they saw it while shopping or browsing (either at a store or online) 12% of the time, and that they would most likely buy a book because they read it themselves as children 4% of the time. Children agree that "my favourite books are the ones that I have picked out myself," and that they are more likely to finish books they pick out themselves. 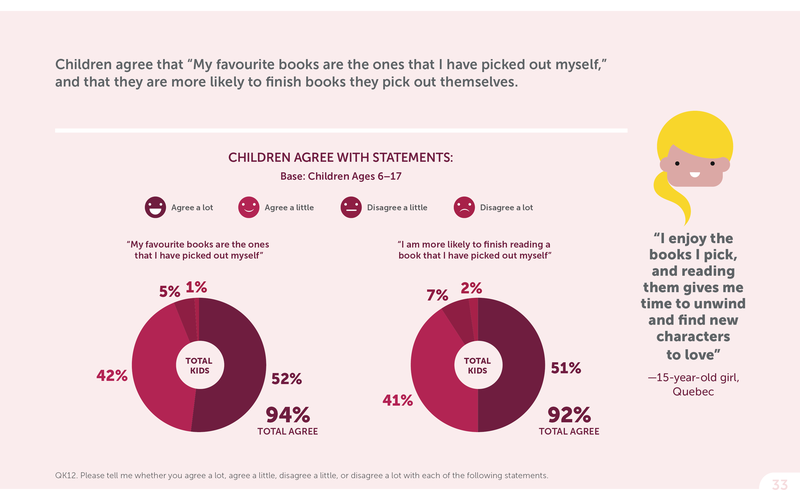 When asked whether or not they agree with the statement: "My favorite books are the ones that I have picked out myself", an overwhelming majority of 94% of children ages 6-177 agreed with the statement in some capacity. 52% of kids said that they agreed with this statement a lot, 42% said that they agreed with it a little, 5% said they disagreed with it a little, and 1% said they disagreed a lot. Children ages 6-17 were also asked whether they agreed with the statement: "I am more likely to finish a book that I have picked out myself", to which 92% agreed in some capacity. In all, 51% agreed a lot with the statement, 41% agreed somewhat, 7% disagreed a little, and 2% disagreed a lot. An open ended response from a 15 year old girl from Quebec about reading books for fun: "I enjoy the books I pick, and reading them gives me time to unwind and find new characters to love"
Three quarters of children choose the books they read for fun all or most of the time, with frequent readers choosing more often. 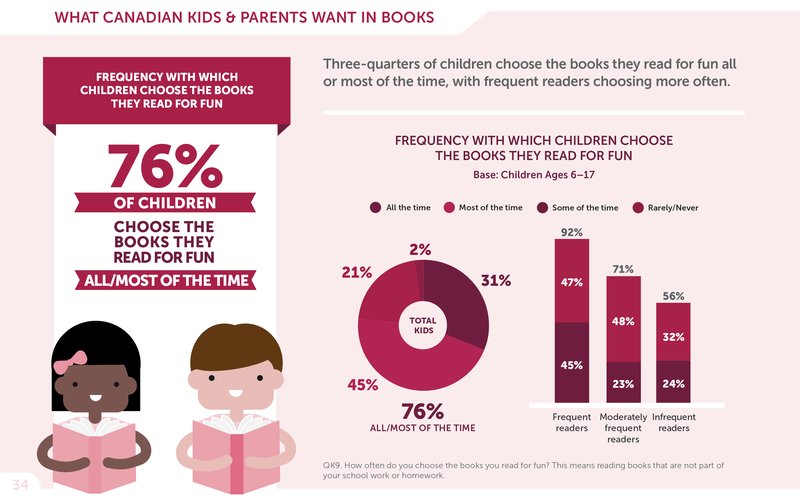 A base of children ages 6-17 were asked how often they personally picked out the books that they read for fun. A total of 76% of kids asked responded that they picked out the books they read all or most of the time. 31% of kids said they choose the boks they read all of the time, 45% said most of the time, 21% said some of the time, and 2% said rarely/never. Amongst frequent readers, 45% said that they choose the books they read all of the time and 47% said most of the time, meaning a total of 92% pick out most of the books they read themselves. Amongst moderately frequent readers, 23% said that they choose the books they read all of the time and 48% said most of the time, meaning a total of 71% pick out most of the books they read themselves. Amongst infrequent readers, 24% said that they choose the books they read all of the time and 32% said most of the time, meaning a total of 56% pick out most of the books they read themselves. Nearly half of children ages 6-17 have trouble finding books they like. Parents underestimate the degree to which children have trouble finding books they like. 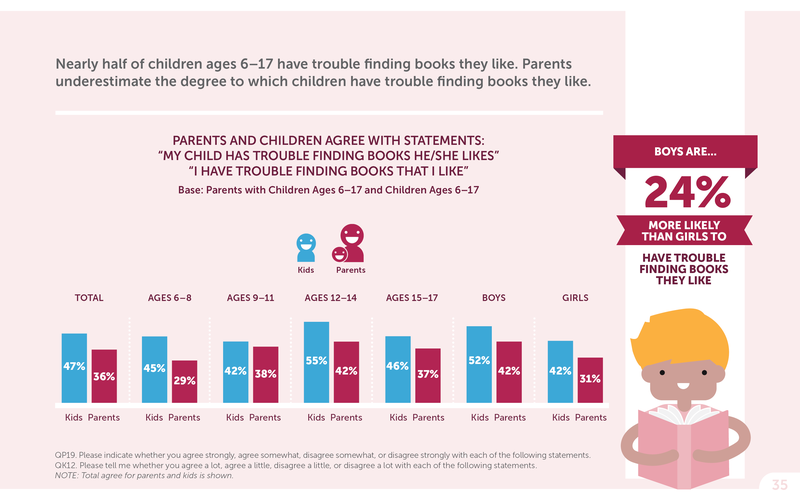 Parents of children ages 6-17, and children ages 6-17 themselves were asked to respond to the statements "My child has trouble finding books he/she likes", "I have trouble finding books that I like" respectively. In total 47% of kids claimed to have trouble finding books they like, while only 36% of parents thought their child had difficulty with this. For children ages 6-8, 45% agreed with this statement, while 29% of their parents agreed with the statement. For children ages 9-11, 42% agreed with this statement, while 38% of their parents agreed with the statement. For children ages 12-14, 55% agreed with this statement, while 42% of their parents agreed with the statement. For children ages 15-17, 46% agreed with this statement, while 37% of their parents agreed with the statement. Amongst boys of all ages, 52% agreed with the statement, and 42% of parents of boys agreed with the statement. Amongst girls of all ages, 42% agreed with the statement, and 31% of parents of girls agreed with the statement. Therefore, it was found that boys are 24% more likely than girls to have trouble finding books they like. Finding books they like is a problem for many children, especially kids ages 12-14. Children from ages 6-17 were asked about whether or not they agreed with the statement: "I have trouble finding books that I like". All told, 17% of kids said that they agreed a lot with this statement, 30% said they agreed a little, 34% said they disagreed a little, and 19% said they disagreed a lot. 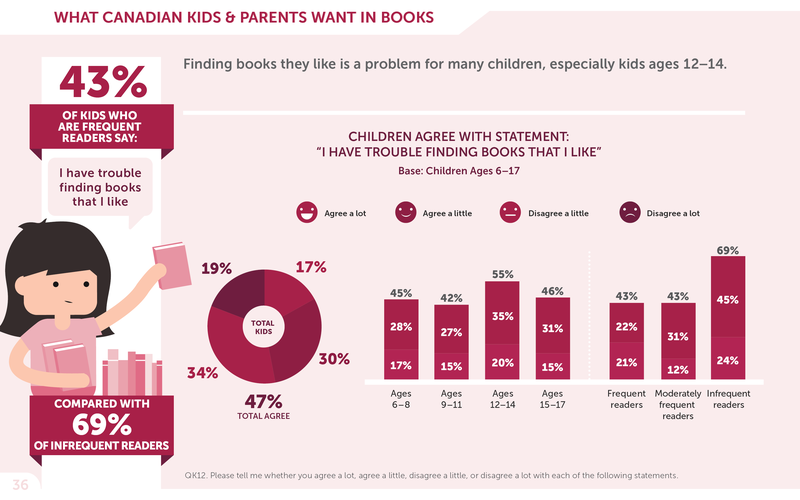 For kids ages 6-8, 17% agreed a lot with the statement, and 28% agreed a little, meaning that a total of 45% have trouble finding books they like in some capacity. For kids ages 9-11, 15% agreed a lot with the statement, and 27% agreed a little, meaning that a total of 42% have trouble finding books they like in some capacity. For kids ages 12-14, 20% agreed a lot with the statement, and 35% agreed a little, meaning that a total of 55% have trouble finding books they like in some capacity. For kids ages 15-17, 15% agreed a lot with the statement, and 31% agreed a little, meaning that a total of 46% have trouble finding books they like in some capacity. For kids that are frequent readers, 21% agreed a lot with the statement, and 22% agreed a little, meaning that a total of 43% have trouble finding books they like in some capacity. For kids that are moderately frequent readers, 12% agreed a lot with the statement, and 31% agreed a little, meaning that a total of 43% have trouble finding books they like in some capacity. For kids that are infrequent readers, 24% agreed a lot with the statement, and 45% agreed a little, meaning that a total of 69% have trouble finding books they like in some capacity. Children of ages 6-17 were asked to identify which people in their lives ecourage them to read books for fun. 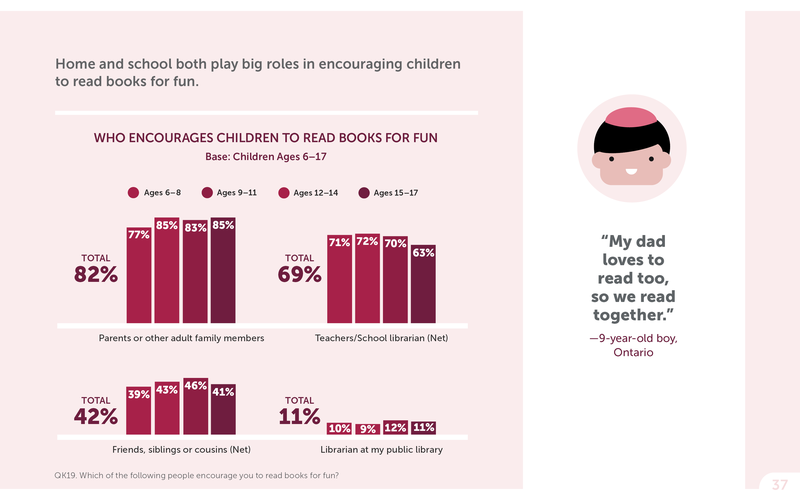 For kids of ages 6-8, 77% said their parents and other adult family members encouraged them to read for fun, 71% said their teachers encouraged them to read for fun, 39% said their friends, siblings or cousins encouraged them to read for fun, and 10% said their local librarian encouraged them to read for fun. For kids of ages 9-11, 85% said their parents and other adult family members encouraged them to read for fun, 72% said their teachers encouraged them to read for fun, 43% said their friends, siblings or cousins encouraged them to read for fun, and 9% said their local librarian encouraged them to read for fun. For kids of ages 12-14, 83% said their parents and other adult family members encouraged them to read for fun, 70% said their teachers encouraged them to read for fun, 46% said their friends, siblings or cousins encouraged them to read for fun, and 12% said their local librarian encouraged them to read for fun. For kids of ages 15-17, 85% said their parents and other adult family members encouraged them to read for fun, 63% said their teachers encouraged them to read for fun, 41% said their friends, siblings or cousins encouraged them to read for fun, and 11% said their local librarian encouraged them to read for fun. All told,for kids of all ages asked , 82% said their parents and other adult family members encouraged them to read for fun, 69% said their teachers encouraged them to read for fun, 42% said their friends, siblings or cousins encouraged them to read for fun, and 11% said their local librarian encouraged them to read for fun, on average. An open ended response from a 9 year old boy from Ontario on reading books for fun: "My dad loves to read too, so we read together." Home and school play a role in giving children great ideas about which books to read for fun. Children of ages 6-17 were asked to pick out the people in their lives that gave them the best ideas about what books to read for fun. For kids of ages 6-8, 39% said that their best ideas from friends, siblings or cousins, 56% said teachers/school librarians, 45% said parents or other adult family members, 39% said school book clubs/fairs, 24% said public libraries/librarians, 13% said stores or websites that sell books, and 5% said social media. For kids of ages 9-11, 52% said that their best ideas from friends, siblings or cousins, 53% said teachers/school librarians, 44% said parents or other adult family members, 40% said school book clubs/fairs, 25% said public libraries/librarians, 19% said stores or websites that sell books, and 10% said social media. For kids of ages 12-14, 52% said that their best ideas from friends, siblings or cousins, 44% said teachers/school librarians, 36% said parents or other adult family members, 29% said school book clubs/fairs, 21% said public libraries/librarians, 23% said stores or websites that sell books, and 14% said social media. For kids of ages 15-17, 55% said that their best ideas from friends, siblings or cousins, 42% said teachers/school librarians, 32% said parents or other adult family members, 20% said school book clubs/fairs, 18% said public libraries/librarians, 25% said stores or websites that sell books, and 23% said social media. For all kids interviewed of any age, a total of 50% said that their best ideas from friends, siblings or cousins, 49% said teachers/school librarians, 39% said parents or other adult family members, 32% said school book clubs/fairs, 22% said public libraries/librarians, 20% said stores or websites that sell books, and 13% said social media. An open ended response from a 14 year old girl from Ontario on reading books for fun: "My friends and I have similar interests and we can talk about the stories and characters." Children and parents both want books that make kids laugh. Parents of children ages 6-17 as well as the kids themselves were asked what kind of books they looked for when choosing a book for their child, or a book to read themselves, respectively. 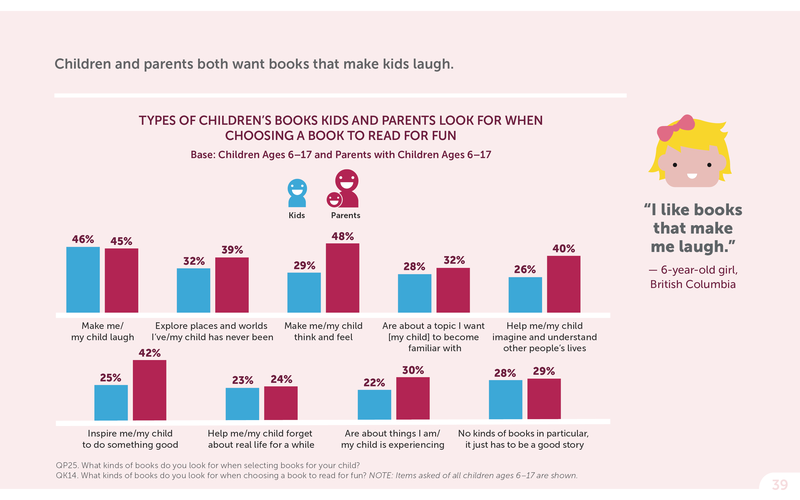 46% of kids, and 45% of parents said that they look for books that make them/ their child laugh. 32% of kids and 39% of parents said that they look for books that explore places and worlds that they/ their child have never been to. 29% of kids and 48% of parents said that they look for books that make them/ their child think on their feet. 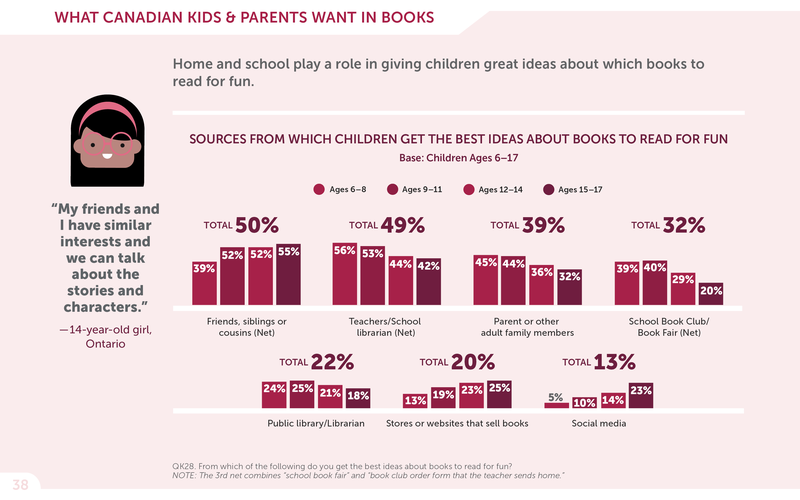 28% of kids and 32% of parents said that they look for books that are about a topic they want (their child) to become familiar with. 26% of kids and 40% of parents said that they look for books that help them/ their child imagine and understand other people's lives. 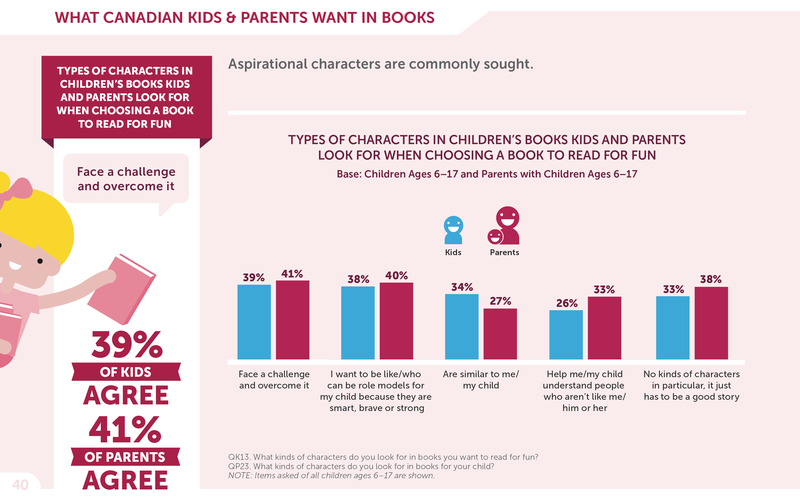 25% of kids and 42% of parents said that they look for books that inspire them/ their child to do something good. 23% of kids and 24% of parents said that they look for books that help them/ their child forget about the real world for awhile. 22% of kids and 30% of parents said that they look for books that are about things they are/ their child is experiencing. 28% of kids and 29% of parents said that they don’t look for any kinds of books in particular; they just have to be a good story. An open ended response from a 6 year old girl from British Columbia on the types of books she likes to read: "I like books that make me laugh." Aspirational characters are commonly sought. Parents of children ages 6-17 as well as the kids themselves were asked what kind of characters they look for in books they want their children to read for fun, or read themselves for fun, respectively. 39% of kids and 41% of parents said they look for characters that face a challenge and overcome it. 38% of kids, and 40% of parents said they look for characters they want to be like/can be role models for their children because they are smart, brave, or strong. 34% of kids and 27% of parents said they look for characters that are similar to them/their child. 26% of kids and 33% of parents look for characters help them/their chil understand people that aren't like them/ their child. 33% of kids and 38% of parents said they don't look for any types of characters in particular, just for a good story. One in five children and parents look for characters who are diverse, differently abled, or break steriotypes. Parents of children ages 12-17 as well as the kids themselves were asked what kind of characters they look for in books they want their children to read for fun, or read themselves for fun, respectively. 21% of kids and 22% of parents said they look for characters that are differently abled (physical or emotional). 20% of kids and 29% of parents said they look for characters that are culturally or ethnically diverse. 95 of kids and 6% of parents said they look for characters that are LGBTQ. An open ended response from a 16 year old girl from Quebec on the types of books she likes to read: "I like fictional characters and fantasy stories"
When asked what diversity in books for children and teens means to them, parents go beyond cultural diversity. 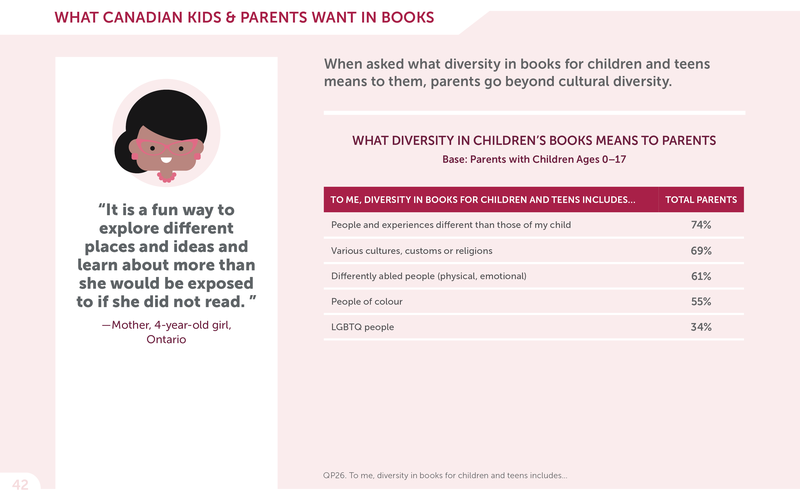 Parents of children from ages 0-17 what, to them, diversity includes in books for their kids. 74% stated that diversity includes people and experiences different than those of their child. 69% stated that diversity includes various cultures, customs, or religions. 61% stated that diversity includes differently abled people (physical, emotional). 55% stated that diversity includes people of colour. 34% stated that diversity includes LGBTQ people. An open ended response from a Mother of a 4 year old girl from Ontario about the benefits of reading books for fun: "It is a fun way to explore different places and ideas and learn about more than she would be exposed to if she did not read." Four in ten kids have read an e-book, but the preference remains for print books. When a base of children ages 6-17 were asked whether or not they had read a book on any electronic device over the past year, a total of 42% said that they had, and 58% said they had not. Children of ages 6-17 were also asked about their preffered method of reading between e-books and printed books. 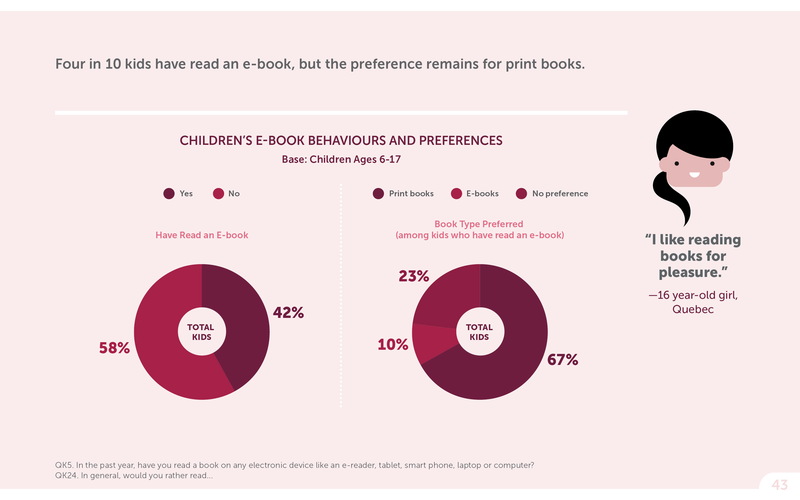 In total, 67% of kids expressed a preference for print books, 10% expressed a preference for e-books, and 23% had no preference either way. An open ended response from a 16 year old girl in Quebec on why she likes to reading books: "I like reading books for pleasure." Eight in ten children will always want to read print books, more so among frequent and moderately frequent readers. 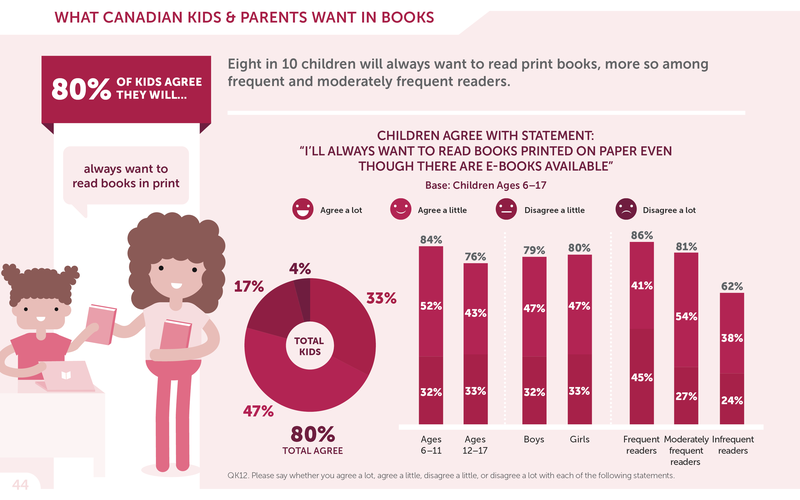 A base of children ages 6-17 were asked whether or not they agreed with the statement: "I'll always want to read books printed on paper, even though there are e-books available." In total, 80% of kids agreed with this statement to some degree, with 33% having said that they agree a lot with the statement, 47% saying that they agree a little, 17% saying that they disagree a little, and 4% saying that they disagree a lot. For kids of ages 6-11, 32% said they agreed a lot with the statement, and 52% said they agreed a little, meaning that a total of 84% agreed with the statement to some degree. For kids of ages 12-17, 33% said they agreed a lot with the statement, and 43% said they agreed a little, meaning that a total of 76% agreed with the statement to some degree. Of all the boys asked, 32% said they agreed a lot with the statement, and 47% said they agreed a little, meaning that a total of 79% agreed with the statement to some degree. Of all the girls asked, 33% said they agreed a lot with the statement, and 47% said they agreed a little, meaning that a total of 80% agreed with the statement to some degree. Of all the frequent readers asked, 45% said they agreed a lot with the statement, and 41% said they agreed a little, meaning that a total of 86% agreed with the statement to some degree. Of all the moderately frequent readers asked, 27% said they agreed a lot with the statement, and 54% said they agreed a little, meaning that a total of 81% agreed with the statement to some degree. Of all the infrequent readers asked, 24% said they agreed a lot with the statement, and 38% said they agreed a little, meaning that a total of 62% agreed with the statement to some degree. 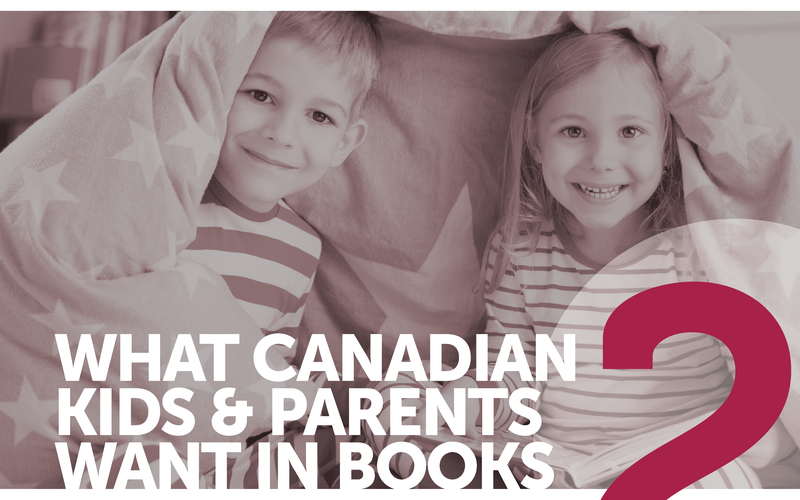 Books or series Canadian parents recommend every child should read. 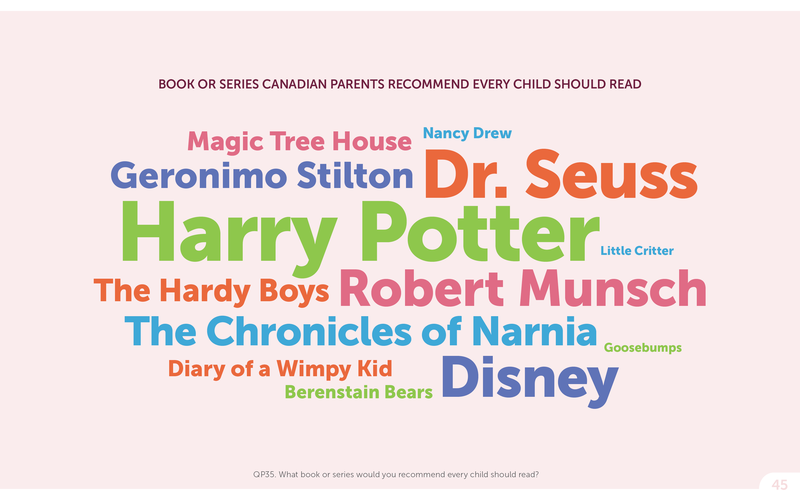 Books or series Canadian kids ages 6-8 say are their favourite. Books or series Canadian kids ages 9-11 say are their favourite. 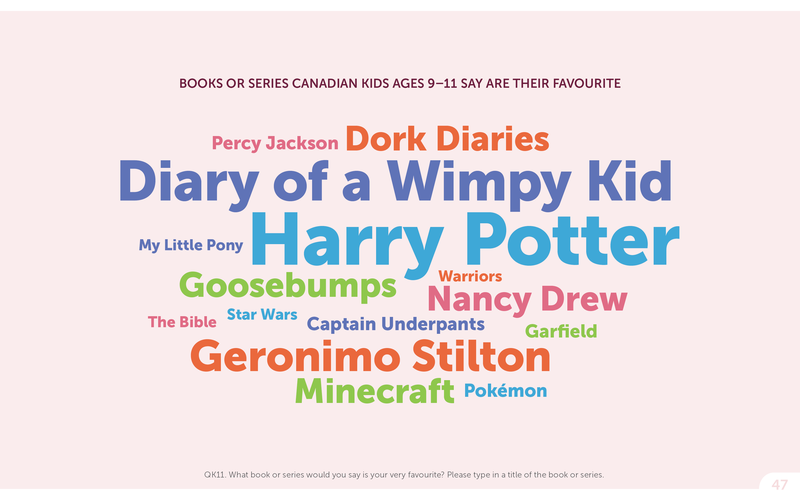 Books or series Canadian kids ages 12-14 say are their favourite. 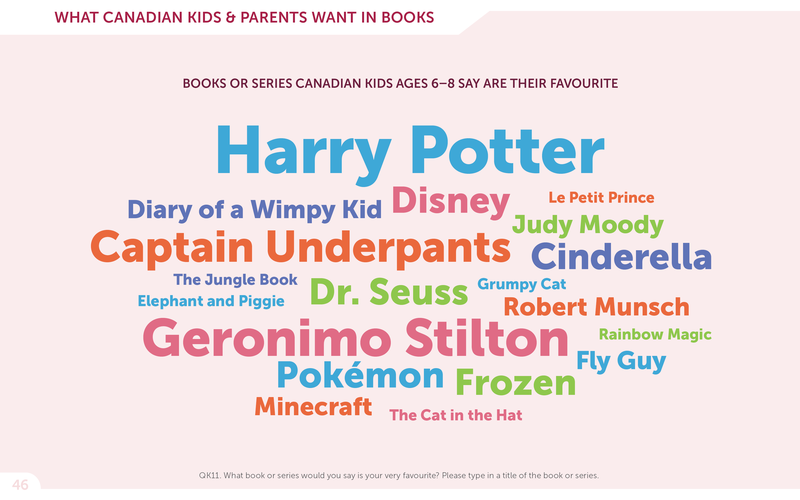 Books or series Canadian kids ages 15-17 say are their favourite.